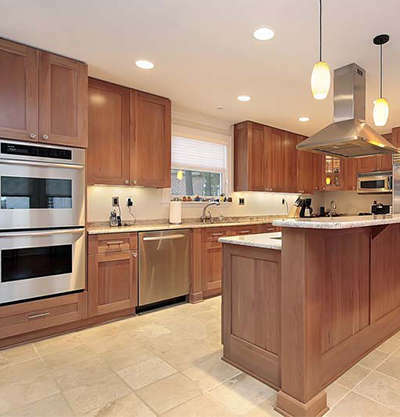 Cabinetry designed just for you, to fit your needs and your budget! …is removing and discarding all your old doors, drawers, and hardware. Then the face of the frames, exposed ends, and underneath of wall cabinets are covered with premium pre-finished furniture grade hardwood, veneers, and plywood. New matching solid wood doors, dovetail drawers, and wood drawer fronts are installed with concealed hinges and full extension drawer slides. Molding and toe kicks are then installed that coordinate to your cabinets. 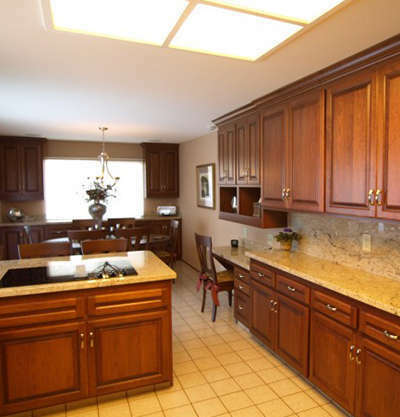 In the process, we can upgrade your kitchen with some new cabinets, change cabinet configuration, add glass doors, change door cabinets to drawers, add roll out trays, trash cans, under cabinet lighting, and extend your existing cabinet to the ceiling. …is when your old doors and drawers are removed and discarded. We then install new solid wood doors and drawers that have been finished to matche your existing cabinets. Some possible upgrades and accents can be done such as changing cabinet configuration, adding glass doors, changing door cabinets to drawers, adding roll out trays and trash cans, adding under cabinet lighting, and extending existing cabinets to the ceiling. While you don’t need to replace your countertops with either cabinet refacing or kitchen restyling, we have many countertop styles and options available to complement your kitchen’s new look. 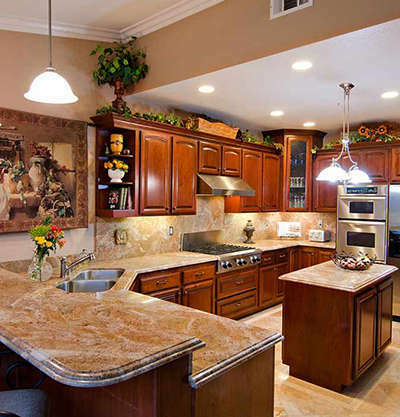 Other kitchen remodeling services are available as well.